Eight years after the destruction of nearly 200 mosques by angry Christian mobs, President Bingu Wa Mutharika, a devout Catholic, is championing a campaign for the reconstruction and renovation of the burned mosques. "The country's leader has been moved by the state in which some of the mosques are in," Presidential Press Officer, Chikumbutso Mtumudzi, told IslamOnline. Mutharika, the country's third post-independence leader, is sponsoring a personal initiative towards the reconstruction of mosques burned by Christian mobs in 1999. Through this initiative, the president is dishing out funds and other materials. The initiative is also providing funds for the renovation of dilapidated mosques. The aftermath of Malawi's second democratic elections in 1999 brought the Southern African country close to the brink of civil strife. Disgruntled Tumbuka, Ngoni and Nkhonde Christian tribes dominant in the north were irritated by the results which favoured then President Bakili Muluzi, a Muslim from the south. They consequently unleashed a campaign of terror against Muslims of the Yao tribe, who were at that time working either as business people or tobacco tenants. At the height of the violence, property, valued at over millions of dollars, were either vandalized or stolen. And for the first time in the history of Malawi, mosques were torched down. 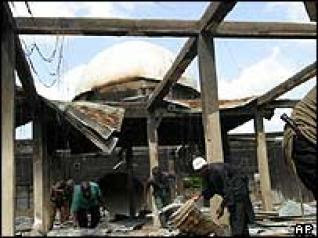 Records indicate that about 200 mosques were turned into ashes. Muslims and Christians are joining celebrations of Prophet Muhammad (peace and blessing be upon him)'s birthday in a rare gesture aimed at fostering unity and co-existence in the religiously-diverse southern African country. "We have sent invitations to the country’s mainline and Pentecostal Churches to join us in the event," Sheikh Amaan King’ombe, spiritual advisor of the committee organizing the celebration, told IslamOnline.net. "We have already received confirmations of their participation in this historic event." 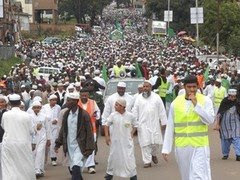 Tens of thousands of Muslims from all walks of life are taking part in the celebrations, including a parade around the two major cities of Lilongwe and Blantyre. Christians from various denominations are showing up for the activities, organized by the Association of Sunni Madrasahs (ASUM) and At-Tariqatun Qadriah Sunni Association (AQSA). "Reactions from our Christian counterparts have been very phenomenal," said a pleased Sheikh King’ombe. Christian leaders said participation in such events would help them learn more about the Muslim faith. "There are some issues about Muslims and Islam, which are often misunderstood by Christians and disputes stem from these misunderstandings," Rev. Father George Buleya, Secretary General of the Episcopal Conference of Malawi (ECM) of the Roman Catholic, the country’s largest Christian denomination, told IOL. "Therefore, by enabling us to take part in events of this nature, our counterparts are according us an opportunity to fully understand these issues." Muslims worldwide celebrate on Monday, March 9, the birthday of Prophet Muhammad. Prophet Muhammad was born in present-day Saudi Arabia around 571 AD on the 12th day of the Rabi` Awwal, the third month of the Islamic lunar calendar. Business and related activities came to standstill in Blantyre, Malawi Tuesday when over 60,000 Muslims from the Southern Region took to the streets of Limbe dancing and proclaiming love and unity marking Prophet Muhammad's birth. The Ziyarah Parade, as the celebration is called, started from Kanjedza Mosque to Mpingwe Sports Club where speeches and prayers were conducted to celebrate the birth. At-tariqatul Qadriah Sunni Association (AQSA) spokesman, Faizal Aboo, said the parade and gathering would enable the Muslim community to reflect on Muhammad’s teachings on love, peace, unity and charity. To translate the teachings of Prophet Muhammad (peace and blessings be upon him) into action, a Malawi Islamic charity donated on Tuesday, March 10, much-needed supplies to a Christian hospital in a gesture praised by Christians and the government. "During his time, the Prophet extended his hand of charity to every person," Razak Kassam, honorary secretary of the Lilongwe Sunni Foundation, an Islamic charity working in the central part of Malawi, told IslamOnline.net. "Therefore, while we are commemorating his birthday, we wanted our sisters and brothers in the Christian community to realize the heart of the person whose birthday we are celebrating."